Huo Yuanjia (18 January 1868 – 9 August 1910) was a Chinese martial artist and a co-founder of the Chin Woo Athletic Association, a martial arts school in Shanghai. A practitioner of the martial art mizongyi, Huo is considered a hero in China for defeating foreign fighters in highly publicized matches at a time when Chinese sovereignty was being eroded by colonization, foreign concessions, and spheres of influence. Due to his heroic status, legends and myths about events in his life are difficult to discern from facts. Huo was born in Xiaonanhe Village in Jinghai County, Tianjin, as the fourth of Huo Endi’s ten children. The family’s main source of income was from agriculture, but Huo Endi also made a living by escorting merchant caravans to Manchuria and back. Although he was from a family of traditional wushu practitioners, Huo was born weak and susceptible to illness. He had asthma and at an early age he contracted jaundice, that would recur periodically for the rest of his life. (It is theorised that he may have had a mild form of congenital jaundice known as Gilbert’s syndrome). Due to his frail frame, his father discouraged him from learning traditional wushu. Huo Endi hired a tutor named Chen Seng-ho from Japan to teach his son academics and moral values. In return, Chen was taught the Huo family’s style of martial arts, mizongyi. Against his father’s wishes, Huo still wanted to learn wushu. He secretly observed his father teaching students martial arts during the day and practised them at night with his tutor. In 1890, a martial artist from Henan visited the Huo family and fought with Huo’s elder brother. Huo’s brother was defeated and to the surprise of the family, Huo fought his brother’s opponent and defeated the latter. As Huo proved that he was physically able to practise wushu, his father accepted him as a student. In later years, Huo went on to challenge martial artists from neighbouring lands and his fame grew as he defeated more and more opponents in bouts. Huo joined his father at work as a caravan guard. One day, while escorting a group of monks, Huo was confronted by an aggressive bandit leader who threatened to attack the monks with his henchmen. Huo fought the bandit leader and defeated him. News of his feat spread and added on to his growing fame. In 1896, Huo went to Tianjin and made a living there by working as a porter in the Huaiqing pharmacy and by selling firewood. In 1902, Huo responded to a challenge advertised by a Russian wrestler in Xiyuan Park, Tianjin. The wrestler openly called the Chinese “weak men of the East” as no one accepted his challenge to a fight. The Russian forfeited when Huo accepted his challenge. The Russian told Huo that he was merely putting on a performance in order to make a living and made an apology for his earlier remark in the newspaper. Between 1909 and 1910, Huo traveled to Shanghai twice to accept an open challenge posed by an Irish boxer, Hercules O’Brien. The two of them had arguments over the rules governing such boxing matches and eventually agreed that whoever knocked down his opponent would be the victor. O’Brien fought Huo and lost. Huo’s victory was a great inspiration to the Chinese people and had them questioning the basis of imperialistic dominance. However, there is a lot of controversy over whether the fight ever took place. A recent article states that O’Brien opted to leave town instead. Huo died in 1910 at the age of 42. In 1989, the tomb of Huo and his wife was relocated. Black spots were discovered in the pelvic bones, and Tianjin Municipality Police Laboratory confirmed that they contained arsenic. Consequently, it is difficult to ascertain whether his death was caused by malicious poisoning or the prescription of medicine. This was because arsenic trioxide has been used therapeutically for approximately 2,400 years as a part of traditional Chinese medicine. 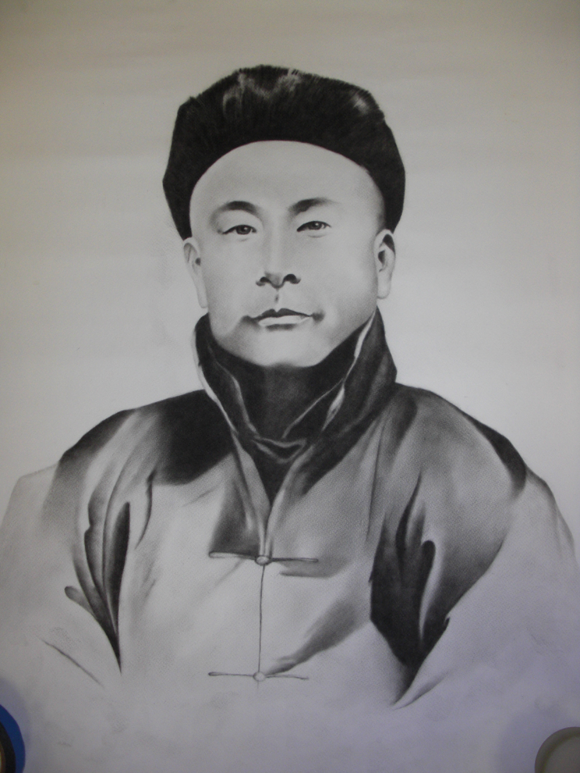 The historian Chen Gongzhe, who was also one of Huo’s students, believed that the cause of his master’s death was hemoptysis disease. Chen wrote that Huo was introduced to a Japanese physician by the judo instructor as his health declined. The physician prescribed some medicine for his condition, but Huo’s health continued to deteriorate. Huo was admitted to Shanghai Red Cross Hospital, where he died two weeks later. Although Chen did not mention that the medicine prescribed by the Japanese physician contained arsenic or any other poison, some leaders of the Chin Woo Athletic Association speculate that Huo was poisoned around the time of his death. Huo was survived by three sons and two daughters, and seven grandchildren and eleven great-grandchildren. Huo died only months after helping to found the Chin Woo Athletic Association. Before his death, he invited Zhao Lianhe of the Shaolin Mizong Style to teach in Chin Woo and Zhao agreed. Subsequently, a number of other martial arts masters agreed to teach at the school. They included Eagle Claw master Chen Zizheng, Seven Star Praying Mantis master Luo Guangyu, Xingyiquan master Geng Xiaguang, and Wu Jianquan, the founder of Wu-style taijiquan. In June 1910, the Eastern Times announced the establishment of the Chin Woo association in Huo’s name. It was the first civil martial arts organisation in China that was not associated with a particular school or style. During the period of the Japanese sphere of influence, the Twenty-One Demands sent to the Chinese government resulted in two treaties with Japan on 25 May 1915. This prevented the Manchu ruling class from exercising full control over the Han Chinese. With their new freedom, Huo’s students purchased a new building as headquarters for the organisation and renamed it “Chin Woo Athletic Association”. Re-organisation, publications of books and magazines, and new styles of martial arts other than what Huo taught, were accepted under the mantle of the new association. In 1918, Chin Woo opened a branch at Nathan Road in Hong Kong. In July 1919, the Chin Woo Association sent five representatives to Southeast Asia to perform a missionary program to expand activities overseas. The five were: Chen Gongzhe, Li Huisheng, Luo Xiaoao, Chen Shizhao and Ye Shutian. They made their first stop in Saigon, Vietnam, where they opened the first Chin Woo school outside of China. Later, they opened schools in Malaysia and Singapore as well. By 1923, these five masters had opened schools all over Southeast Asia and visited nine different countries. In 1966, Shanghai’s Chin Woo school was forced to discontinue its activities by the Chinese Communist Party due to the Cultural Revolution, whose goal was to destroy old ideas, culture, customs in order to modernise China. Those restrictions were later lifted in 1976 and activities continued in Shanghai’s Chin Woo. Currently, Chin Woo is one of the largest wushu organisations in the world with branches in Japan, Hong Kong, Macau, Vietnam, Malaysia, Singapore, Sri Lanka, Poland, Canada, the United Kingdom, the United States, Australia, and Switzerland. JK Wong Kung Fu Tai Chi Academy is the headquarters of the Chin Woo Athletic Association in the United States. The academy is located in the heart of Dallas, in Richardson, Texas. No Comments to "Huo Yuanjia"